The Commanding Officer of the "El Camino Español" welcomes you to this webpage and invites you to learn more about this Army unit with home port in Cartagena Naval Base. 1 fore propeller for transversal thrust. 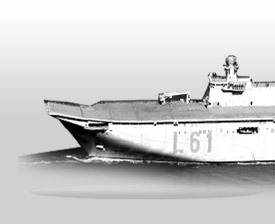 The A-05 is an Army ship tasked with transport missions in the Mediterranean coast, mainly between the peninsula and the north-African cities of Ceuta and Melilla. The ship has also taken part in several peace-keeping operations like the ones in Bosnia, Kosovo and the Lebanon. Our home port is Cartagena Naval Base. This base is the main Mediterranean logistic support hub for the Maritime Action Fleet. "El Camino Español" was the name of a land route designed by the Spanish king Philip II to transport money and troops in support of the wars in the Low Countries. Maritime transport in the 16th century was hazardous for Spanish ships in the English Channel due to the constant disputes with France and Great Britain and thus, a military corridor was set up through friendly territories, from Milan to Brussels. This route called "Camino Español" was first used by the Duke of Alba in 1567 and the last Spanish contingent marched northwards through this land corridor in 1622. The "El Camino Español" (ex-Araguary, ex-Mercantil Mage, ex-Cyndia) is a Ro-Ro container ship built in Rio de Janeiro in 1984. The ship was procured by the Spanish Army in 1998 and refurbished in Bazán Shipyards in Cartagena upgrading propulsion, habitability standards and enhancing cargo capacity with a new intermediate deck for light vehicles. The ship was delivered in 1999 and transferred to the Spanish Navy on February 15th 2000. The current crew of "El Camino Español" consists of 46 men and women from the Spanish Navy although the ship is Army property: 6 officers, 7 NCOs and 33 leading seamen and ratings. Each year there is a series of maneuvers programmed for Army units in Ceuta and Melilla and the A-05 is tasked with the deployment and redeployment of materiel. In order to keep the ship in full readiness, there are also training activities and exercises scheduled every year.